Norwegian black metal institution Mayhem have announced a US tour this winter with co-headliners Watain and openers Revenge. The bands are quite well-matched, as Watain have been bearing the theatrical black metal torch (both literally and figuratively speaking) for awhile now, and Revenge are an excellent current incarnation of classic black metal evil. At the very least, the tour is sure to include a lot of blood and fire. 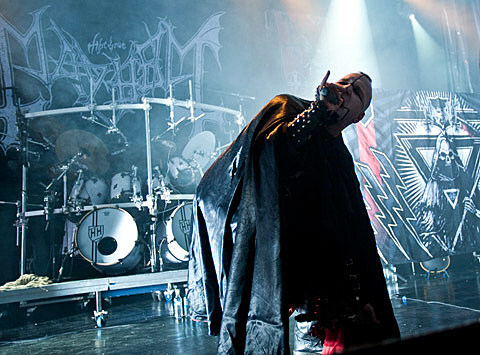 Revenge frontman James Read officially commented on the subject of the tour–“Prepare to bleed upon the Altar of Triumph. No Scene, No Brotherhood, No Remorse. Behold Total Rejection…” Questionable capitalization aside, this should be an awesome tour. The “Black Metal Warfare Tour” will hit NYC on January 10 at Webster Hall. Tickets for that show will be on sale Friday (10/17) at 10 AM.